Is Google playing catch-up to Microsoft's Bing? How's that for a role reversal! While Microsoft's Bing has been trying hard to capture the success of rival search engine Google, Google now appears to be copying Bing when it comes to innovations with the introduction Tuesday of a feature called Similar Images. 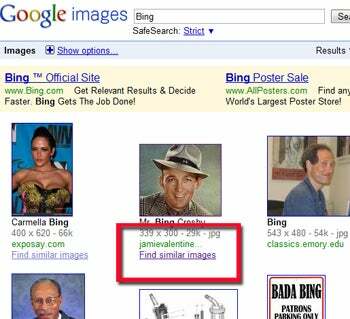 Google's Similar Images feature sounds awful similar to an identical Bing feature called Search Similar. 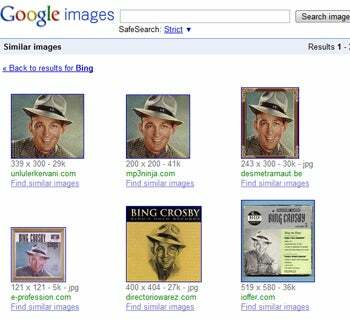 The Bing image search feature has been available since Bing launched. Search Similar was also a feature in Microsoft's previous search engine Live Search. The way the similar search feature works on both Google and Bing is if you search for "Jaguar," for example, you can use the "Find similar images" to hunt for more pictures of either the animal or the auto. If you want to see more images of a jaguar perched in a tree, no problem. Just click on the Google Similar Images button or Bing's Search Similar button next to an image of a jaguar up in a tree. Actually, Google's Search Similar Images was first launched in test mode in Google Labs last April and on Tuesday it is officially being rolled into Google's search engine as a live (not-beta) feature. It's unclear how long Microsoft's Live Search had the Search Similar feature. Google is copy-catting Bing at a time when both search engines are locked in a fierce battle for search market share. According to market research firm ComScore both Google and Bing increased their shares only slightly in September compared to August. ComScore reports Google owns 64.9 of the search market, up slightly from the previous month of 64.6. Bing owns 9.4 percent (up from 9.3 last month). Yahoo slipped from 19.3 percent to 18.8 within the same one month time frame, according to ComScore.